This week, my best friend, maid of honour, and all around awesome person, Natalie Melanson, wrote a blog post about tips on improving your resume. The old paper CV is slowly disappearing. The past few years has seen the birth of unique and creative resume. The number one benefit of an online resume is LINKING. If you have a PDF resume, then you can have an online resume. It is always nice to take your traditional resume and save it somewhere online. If it is saved online, you can easily link to it on your business card or in an email. I host mine on my blog. Take your online resume one step further and make it interactive. This allows you to include pieces from your portfolio and easily link to any of your projects that live online. Just because your resume is online shouldn’t give you permission to overflow it with information. Keep it simple with a few different pages separating skills from experience and using images where possible. A benefit to a well constructed website resume, and any of the online resumes described below, is the SEO. Recruiters have started to take to the online streets to find candidates. Here is an example of a website resume. The visual resume can be a fun and unique way of using images and graphs to display your skills. If you are creative enough build an infrographic resume tailored to the job you are looking for. If you draw stick people like I do, then Re.vu is a good tool for you. 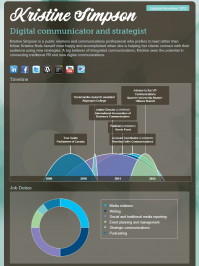 The program drags information from LinkedIn to build a unique visual resume. The benefit of a visual resume is the ability to reach people who retain information better through images. Here is the Kristine Simpson infographic. Are you the type of person that looks better in person than on paper. If you tend to do really good in interviews, why not give your potential employer a sneak peak of your personality before the interview. Videos are virtual face time that your miss out with the traditional resume. There are two styles of video resumes: 1) a traditional format that mirrors your paper CV where you list off your skills, experience, etc. If you do a traditional video, include a prominent link at the top of your resume that encourages the interviewer to watch the video and follow along with the paper CV. 2) the musical/funny video. If you are applying for a job that requires you to be “out there”, then a wacky video may be what you need. Check out Erica’s wacky video she sent to Ellen DeGeneres. I recently built my own Pinterest resume. Similarly to a visual resume, Pinterest helps explain your talents, skills and experience in a visual format perfect for recruiters that learn better through pictures. Pinterest allows you to easily create boards for each section of a traditional resume: skills, experience, volunteering, etc. This is not a type of resume, but QR codes can be a unique way to link to your resume online. In the video where Erica sends her video resume to Ellen DeGeneres, you can see that Erica first sent a huge box covered in QR codes, all of which linked to her video resume. If you like to search for your job through networking, include a QR code on your business card that links to your online resume. Last, but certainly not least, your social media resume is as important as any of the resumes above. Your social media resume is not something you create, it is something you build over time. When applying for jobs make sure your social properties reflect your resume. Ask yourself, if the interviewer asked you to sign in to Facebook so they can see your profile would you be comfortable with what they saw? If not, you may need to think twice about what you are posting online. But that is a whole other story. You must be thinking to yourself, that is a lot of resumes, do I really need to have them all? The plain answer is: no. However, having multiple styles and versions of your resume simply allow different recruiters to interact with your brand in a format that is most comfortable for them. What kind of unique new age resumes do you have? This entry was posted in Infographics, Public Relations, Social media, Videos and tagged careers, CV, infographic resume, job hunting, job tips, jobs, kristine simpson, natalie melanson, online resume, Ottawa, pinterest resume, resume, resumes, video resume, website resume by Kristine D'Arbelles. Bookmark the permalink. Next → Next post: Young PR Pros: Episode #40 – Kristine gets a new job!